That's one holy high roller. 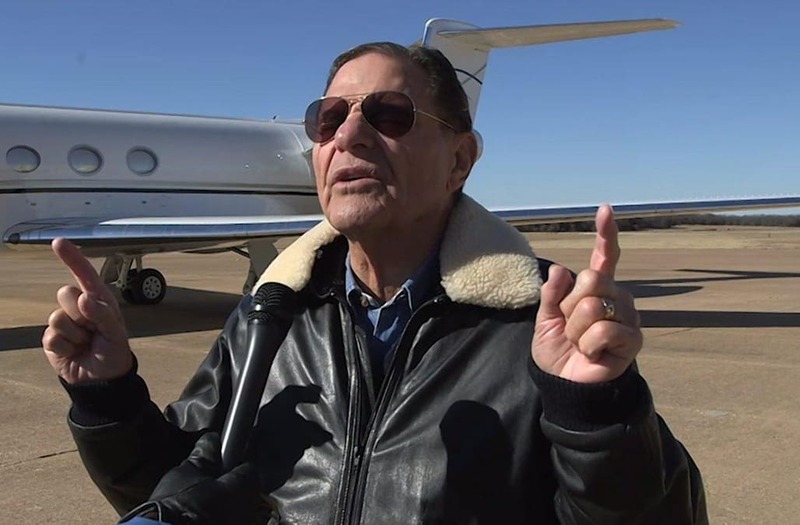 Kenneth Copeland, believed to be among the richest pastors in the world, is under fire for a recent braggadocios Twitter post celebrating the arrival of his Gulfstream V private jet, which he claims was purchased by his parishioners - and the big guy upstairs. The 81-year-old tweeted, "Mission accomplished!" along with a graphic showing himself standing before the jet. He thanked his "special team of believers" for their dedication to his parish's many "special projects," which evidently included procuring a personal aircraft. The millionaire man-of-God linked to a video of his first moments with the plane, during which he appeared in awe of his new ride. Hindu priests sit inside a cave as they perform evening prayers on the banks of the river Ganges in Devprayag, India, March 28, 2017. REUTERS/Danish Siddiqui SEARCH "SIDDIQUI GANGES" FOR THIS STORY. SEARCH "WIDER IMAGE" FOR ALL STORIES. TPX IMAGES OF THE DAY. "Are you looking at this? Hey, are you seeing this?" Copeland said in a video of himself first laying eyes on the aircraft. "I hope so - you bought it, you and Jesus." The televangelist then lifted the plane in prayer, referencing a 2002 chat he and the big guy in the sky had about "new partners" who would be religious men and money-savvy. "When you said in 2002, 'I'm sending you new partners who are very strong financially and they'll obey me, and I will increase your longtime partners and they will obey me," Copeland said with a laugh. "'and you will not come short, and you will not fail, and you will not lack, and you will not come behind, and you will not be diminished.' Praise God - isn't that good?"